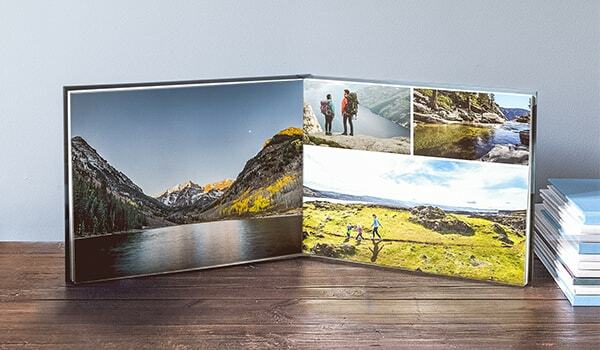 Don’t let your memories sit on your laptop, bring them to life with a medium photo album from bonusprint. You can upload your favourite photos and customise your book any way you like. Here’s how to get started and order yours online. A medium photo book is the perfect size to flip through on a cosy afternoon. With a soft cover book, you can relive all the best moments from your last weekend away. You can reflect on your travels with a spiral-bound book full of beach shots and landscapes. And you can look back on adorable baby photos in a medium square album. They make a gorgeous gift for someone special, or they’d be a great new addition to your bookcase. And because our medium photo books are around A5-size, they’re easy to carry around too. To get started, head to our creator tool. You can use either the online or offline version to create a medium photo book. You’ll see a full range of size options, including small, medium, large and extra-large. Then simply filter by medium to select the style you want. You can also see the dimensions of each book. So, if you were looking for an A5 photo album, maybe go for a 15 x 20 cm portrait photo book, which is similar in size. Then you can start uploading the snaps you love and get customising. Ready to order your new medium photo album? In our creator tool, there are loads of fun editing options to help you personalise your photo book. You can add captions, play with clip art and add backgrounds too. You can even customise your own cover with a photo. When you’re happy with your design, click ‘add to basket’. Here you can add the finishing touches, like select a premium faux leather cover for a hardback book, or add gloss paper to make the colours pop in your pictures. Then you’re ready to confirm your order and have your medium photo album delivered to your door.